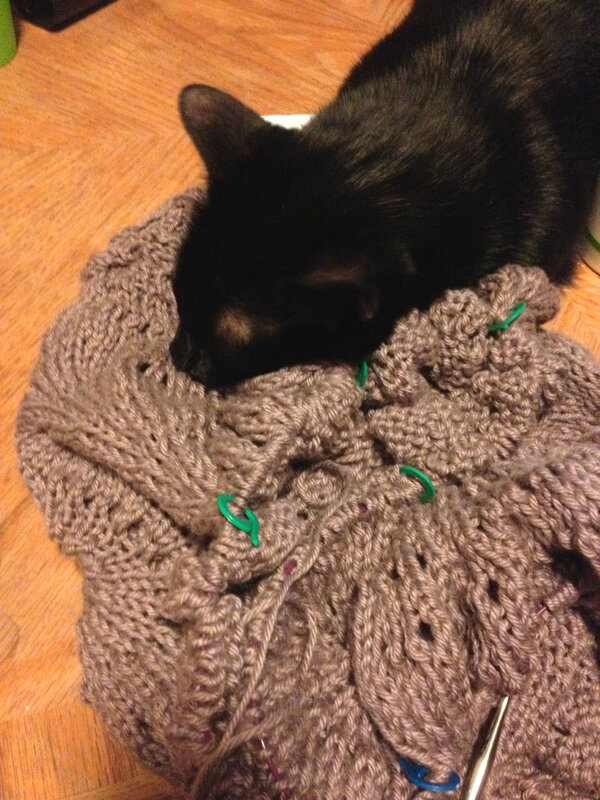 The shawl is now cat-approved for cuddliness. There are some weeks that are so slow yet so busy and productive that it’s just a relief to reach Friday. I didn’t know if I’d make it this time. My allergies have flared up, and my eyes are itching like crazy. It doesn’t help the knitting, I’ll tell you that. So, thank goodness it’s Friday! I did have a really fun Thursday, though, hanging out with a good friend of mine. The picture you see above is a sweet, biting (it’s like her kisses to bite), soft cat belonging to my friend. I set my knitting on her coffee table for a bit, and the cat gravitated toward it. She had kind of been watching me all evening and every once in a while would bat at the yarn as I tried to untangle the mess I’d made of the skein. What was fun, though, was while my friend and I were playing Scattergories, the batting turned into a full-on cuddle. At first, she lay near it. Then, she decided it was okay to lay on it. I felt bad having to take it home from her! She was so sweet. That’s nothing like knitting with my cats. I have three: AC (air conditioner, no joke), Zebra, and Starsky. Starsky thinks me playing a game with her, but I have to watch out or she’ll drag my knitting away and try to shred it like she does paper. This is also why I don’t read when she’s around. She bites my book and tries to take it away from me. AC will curl up beside me and only stir if I bother her. Zebra, though, is the biggest pain. It doesn’t matter if you’re knitting, reading, or on the computer. If you ignore her, she will sit on the knitting, book, or computer to force you to pay attention to her. Luckily (or most times, unluckily), my cats don’t live with us right now. They grew up at my parents’ house, and we’re not sure if they’d make a move very well. See, they’re indoor/outdoor cats and are used to having their freedom. I don’t think I’d let them out of the house in an area that they’re not familiar with. It makes for a very quiet house, too, which I’m not 100% fond of just yet. I’m still hunting for t-shirt ideas. Joan of thethingaboutjoan suggested tie-dying, and it was on my mind all evening. I haven’t done tie-dying since Outlaw Ranch, Lutheran summer camp in South Dakota. The possibilities for this are endless! We could dye different strands of our t-shirt scarfs different colours. We could do alterations and make old t-shirts into more summery clothes with bright, bold colours. We could make multicoloured t-shirt yarn. This could be so much fun! Hey! Thanks for the shout-out! I’m intrigued by multi-colored t-shirt yarn, but really, I’m just looking forward to whatever you cook up. Have a great weekend!